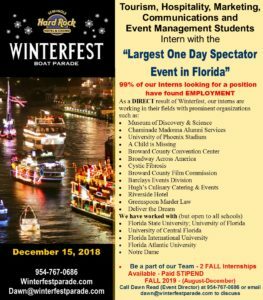 How Can I Intern With Winterfest? INTERN with WINTERFEST and be a part of one of the Largest Events in the WORLD! Assist with marketing and publicity/promotions including advertising, public relations, and added value media for high quality performance and cost effectiveness for this non-profit organization. Coordinate the Speaker’s Bureau by working with media, boaters, homeowner’s associations, and the Greater Fort Lauderdale community. Contact: 954-767-0686 for more details!